Appearance: Pours a deep mahogany with burgundy highlights and a tan head. The head quickly recedes into still, beautiful lacing. Aroma: Smells sweetly of tangerines, dark chocolate, cola, clove. It’s similar to Dr. Pepper, though more complex, warm, and deeper. Flavor: The cola comes through first, then following with a bright citrus twang. It finishes long with a dark chocolate aftertaste. Absolutely delicious. Some cherry-pie like fruitiness comes through on repeated swigs, reminding me of something akin to a Gulden Draak Lite. I could drink this for a long while. Appearance: Very similar to the 2010, but the head stays atop the beer the entire time, thicker and creamier. Aroma: After tasting the 2010, I did not think these would be too different, however one whiff of this one tells me differently. I get freshly ground cinnamon and dashes of mint, as well as some of the cola/clove from the 2010. Flavor: My first impression is that it’s roastier and earthier than the 2010. 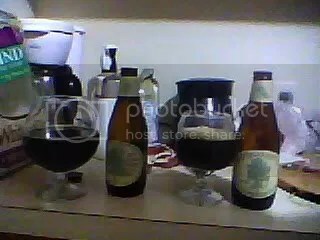 These beers are of the same pedigree, though, as the cola and clove qualities come through. Touches of wintergreen lighten it before the dark chocolate finish. The body is fuller on this one also. Overall impression: I am surprised at how incredible the 2010 tastes. I did not believe that a year would be this kind to this beer, but I guess I was wrong. Of the two, it is my favorite, though the 2011 is great in its own right. It’s creamy with a nice roasty presence. I can’t wait to see how it does in a year, or two, or three. I have had it happen several times that I go into a local bar/pub, and when I sit down and take a look at the beer menu, I find that nearly 80% of beers listed are some sort of pale, American-hopped ale, many of those using similar, if not the same, varieties of hops and yeast. I would venture to say that most craft beer drinkers wouldn’t be able to discern the difference between some if blindfolded. With the rise of IPA, it seems more and more people are associating it with good beer. Where it once was that Bell’s Amber Ale and Oberon were considered their flagships, Bell’s Marketing Director, Laura Bell, is quoted in the new issue of Michigan Beer Guide as saying “Two-Hearted could take over Oberon as our number one selling beer if we can ever make enough of it.” And while I love Two Hearted, it shows the rising demand for more and more hops. So back to the bar–I really just want more variety and more knowledge. I get discouraged when I look at a menu and I have to search for something that is more balanced towards malt and yeast. When people find out that I make beer, usually the next thing they ask is “So, do you make IPAs?” And while the short answer is yes, I do, I immediately want to tell them about my Belgian Dark Strong in the works, or the 20 gallons of various sour ales I have aging/fermenting right now. Just like there is more to beer than light American lagers, there is more to it than IPAs. Now that I’ve got that off my chest, I need to figure out when I’m going to have time to bottle my pale ale. Mash at 154F for 60 min. Sparge with 180F water. Before bottling, coarsely grind 6oz. of MadCap’s Oktoberfest blend and place into a sanitized muslin bag. Place in a sanitized bowl with 3 cups of water and let sit in the refrigerator overnight. Remove coffee grounds and let drip, then add the liquid coffee into your bottling bucket. Appearance: Pours dark black with a tan, espresso-like head. Very few highlights here. Aroma: Strongly of coffee, as well as notes of dates, molasses, some tobacco, raisins. Slight alcohol sweetness. Taste: Expounds largely on the coffee, again with dark fruits and molasses, but not too sweet or cloying. It ends with a nice roastiness that cleans the palate. Mouthfeel: Slick, and not as full as I would like. 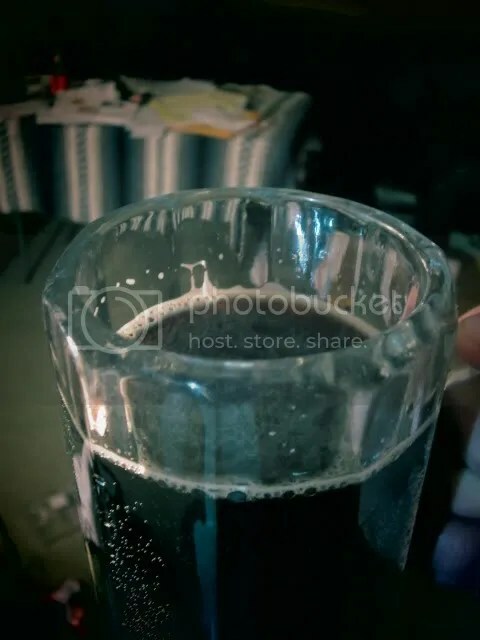 Low carbonation leaves the ale smooth. Overall: This is one of the better beers I’ve had a hand in brewing, and one I’ve ear-marked to make again. It’s very drinkable, but also delicious. The complexities of it are subtle, but are certainly open for exploration. I am very happy with how this turned out and feel it has come very close to hitting what was originally envisioned. I can only think of a few tweaks to make, such as perhaps a higher mash temp to add a little more body. Last week I had a day off, so I decided to brew up a no-boil Berliner Weiss. Not only was this my first try at the style, but it was my first attempt at decoction mashing. Traditionally Berliner Weiss’ are very low in IBU’s, in the 3-7 range. So, since this is a no-boil, I pulled 3.94 qts. (about a gallon) from the mash to boil for the decoction, and added the hops in with that. Despite boiling for around 20 minutes, I undershot my target saccharification temp (154) by about 10 degrees. Fortunately I had some hot water ready to add to get it up to temp. I made a starter with WYeast Lactobacillus and a quart of apple cider a few days before brewing. Lactobacillus loves simple sugars, hence the apple cider. It also loves warm temps, so it sat next to my heating vent. I let the wort cool on it’s own to 90 degrees, then pitched the Lacto starter. 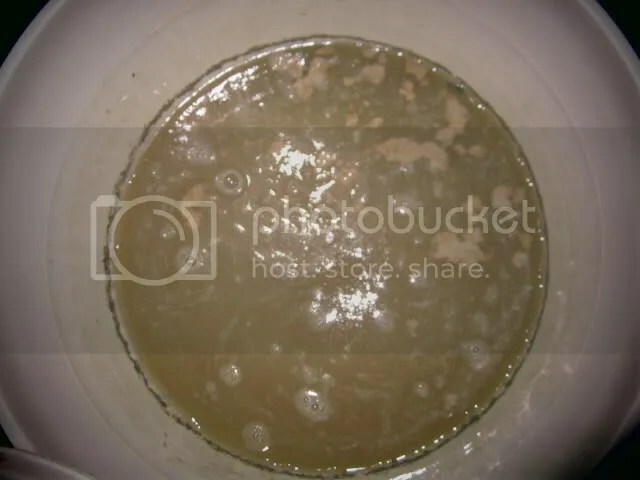 The picture above is of some very active Lacto at work. 2 days later I pitched a packet of US-05 to finished out the fermentation. 1oz. 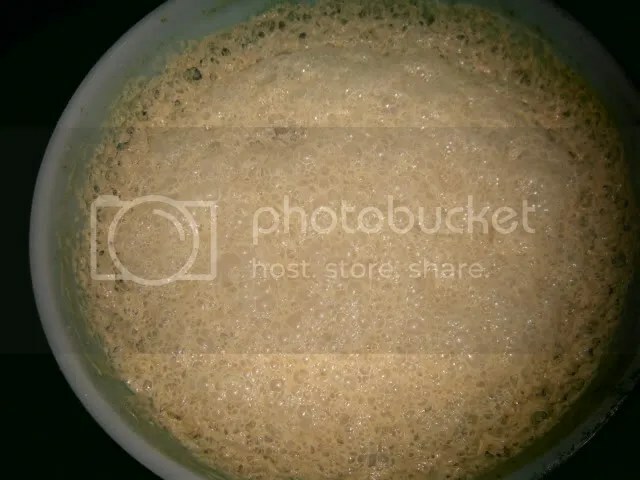 Saaz added during decoction. Mash Notes: Used in some authentic German styles. Attempt to draw decoction from the thickest portion of the mash. Profiles vary. Some traditional German mashes use a long acid rest at 40 deg C. Also some sources recommend the decoction amount be given a 15 minute saccharification rest at 158 F (70 C) before boiling it. The phone started ringing a half hour before we opened (we open at 8am) and the calls continued throughout the day. When would we be getting CBS? How much would we be getting? Would it be possible to reserve a bottle? Do we have any left? Any idea where to find more? When one early caller asked if our three cases had arrived yet I asked him how he could possibly know that we were getting three cases. I am not going to lie and say that I don’t care about these releases. I have had some great times with releases like KBS, Dark Lord, etc. It can be exhilarating waiting in line with friends and new-found friends, having some rare beers along the way. But each year, and with each release, I feel like I care so much less. It gets to the point that I don’t care about the bottles–I’ll have a taste, but I don’t need to spend that much time and effort on a beer I don’t even know if I’ll like. And that’s another thing: it’s hard to live up to the hype surrounding these releases. I more often than not feel underwhelmed because I hear people describing it in some life-altering way, and I come away with not much more than palate fatigue.